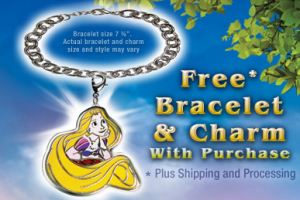 Get A Free Bracelet & Charm With Your Tangled Purchase. All you have to do is enter the code from the movie into your Disney Movie Rewards account between 3/29 and 6/30/11. You will have to pay Shipping and processing.